February 2019 — It’s most evident that the rise in conversation around flexible working has grown expediently. The verbiage has umbrella multiple meanings relative to the physical space as well as a specific workstyle which has greatly altered both the work and business models. This change has been primarily driven by an increase in independent workers from the ‘gig economy’, corporations deploying more workers remotely to satellite offices along with the ‘work from home’ programs. As the corporate RE portfolio becomes more limber, the need for flexibility within office space is often referred to as Flex space or Shared space. This type of space has increasingly become copied throughout the marketplace because it gives the business model what it wants, which is agile real estate and an attractive workplace. Attractive workplaces are not merely about the aesthetics, but the opportunity of choice by the occupant. Choice includes how to work, either individually or collaboratively (usually both) along with varying levels of privacy. The strength in this model is that the environment allows the occupier an ebb/flow of movement directed by one’s own nature of work throughout the space. With ‘flexible space’ solutions continuing to rise, flexible space is also emerging as a ‘tool’ in improving employee engagement and evolving company culture. So how much of this flexibility are corporations looking for when in reality it may already exist within their own workplace strategy and RE portfolio? And once defined, how is it managed? This new type of space management can be challenging for many of today’s FM as s/he is steadily analyzing the ‘ongoing best optimization rate of use’ within their RE portfolio. Therefore coworking facilities have become quite appealing as an extension to the RE portfolio by enabling the FM team to quickly deploy concepts that otherwise may be to lenthy in time to build internally. Initially coworking facilities were merely incubation hubs to foster new synergies apart from a corporate presence, however now this model has migrated into an extension for touchdown spaces with corporate travelers, home to project/product development teams and surge spaces for companies who are actively (re)defining their own RE model. These outside networks have largely accelerated due to many reasons. Historically it has been a need for added square footage in an optimal vicinity along with a desire for an amenitized workplace. However, clever membership models are increasingly becoming the forefront drivers in continuing to lure corporations towards this platform over a traditional path in real estate strategies. The terms by coworking properties can be most favorable in allowing organizations to customize the design of space to fit the budget, culture and style of work all while managed under that outside network. Furthermore, coworking is better able to withstand a future economic downturn compared to traditionally owned real estate properties. The market on coworking networks are plentiful, from small niche/community players to global operators. Differentiators such as services, architecture/location, and tenant/member exclusiveness (per floor/building) begin to flush out which ‘coworking company’ may be most viable for an organization’s workplace model, even if the solution is temporary. Additionally, a new trend has begun to blur the distinction between CRE and coworking operators. Lease fees or membership models that once separated the two types of markets are now blending (in part) as this hybrid of a business model grows. In Colliers International U.S. Flexible Workspace Outlook Report (Jan/2019), “flexible workspace continues to grow at a rapid pace, now accounting for one-third of office leasing in the last 18 months alone”. Additionally, Colliers International reported a “strong concentration of flexible workspace in markets with significant employment in professional services and in high-wage markets.” Manhattan still clearly dominates the market in overall amount of sq. 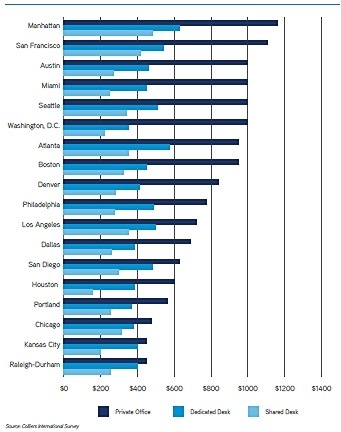 ft. of coworking space per city, however the fastest growing regions include Dallas and Raleigh-Durham as they have doubled in need for flexible workspaces in only 18 months. Fees for outsourcing flexible workspaces vary considerably, and naturally coincide with high rental markets. Compared to the traditional markets, sometimes this platform can appear more costly. The most notable financial benefit to utilizing a coworking platform is the flexibility of the organization’s RE portfolio. Should a downturn in the economy emerge, it is much easier to eliminate this expenditure from an operations cost versus an owned property. Member/lease terms can be written for shorter durations without (all) the financial penalties associated with traditional leases. Statistics remain vague regarding which types of workers/organizations found key success in using this type of model. Data illustrating the concentration of coworking spaces have been more prominent with Tech and High Wage markets. Additionally, these types of workforces typically are attracted to the types of organizations who provide access to amenity-rich environments whether within the facility or nearby. Others like several large organizations, such as Verizon, IBM and Microsoft simply want a chance to test new markets for their employee base or the ability to interact with innovative startups in the neighborhood/building. The best frameworks are yet to be determined in developing an optimal strategy for a company’s RE portfolio management. With a shift towards ‘space as a service’ and employee expectations changing, ‘workplaces have evolved to become a tool’ in fostering culture as well as the ongoing development of organization effectiveness. These agile/flexible work platforms have become the new synergy to assist an organizational model to endure. Susan Streur has worked extensively over 20 years in leveraging space as a strategic asset through “advanced product applications” with emerging workstyles. Her insight around workplace effectiveness has successfully driven strong customer satisfaction through the enhancement of the user experience. She is an active member of the Workplace Evolutionaries Chicago Hub. Need additional workspace? Your company may want to look into closed retail spaces, finds this JLL report August 13, 2018 In "Surveys and Trends"
Here’s the trend-setting way CBRE is meeting the need for flexible office space in a Class A tower — an on-site “plug-and-play” coworking space March 8, 2019 In "Products and Services » Services"
See which building surveying software the City of Nampa chose to help manage its space and facilities more efficiently February 8, 2019 In "Contract Awards"
CBRE’s free online resource can help your organization keep up with evolving real estate and space usage trends August 1, 2018 In "Products and Services » Publications"